Nikki, of Askmewhats and a very good friend, is giving a Seminar involving Makeup tips and tricks. 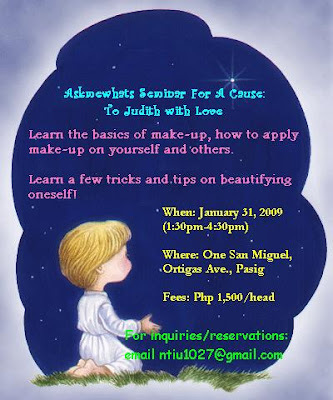 This is a Seminar-For-A-Cause is her way to help out her friend's sister, Judith, who was diagnosed with Leukemia, currently undergoing chemotheraphy. Let's us not surrender her to cancer. PRAYERS will help, too. Please pray for Judith's survival.